DON'T FORGET THE MANDATORY WAIVER! Please note: Any cancellations after Tuesday 10/16/18 will not be allowed a refund. As the sun sets on days filled with thrills in all of Universal’s theme parks, the night awakens with a frightening chill at Universal Studios Florida™. This year, time twists and turns on itself—ripping cinematic greats, cult classics and even original nightmares from decades past into a new era of fear with more terrifying haunted houses than ever, sinister scare zones and outrageous entertainment. 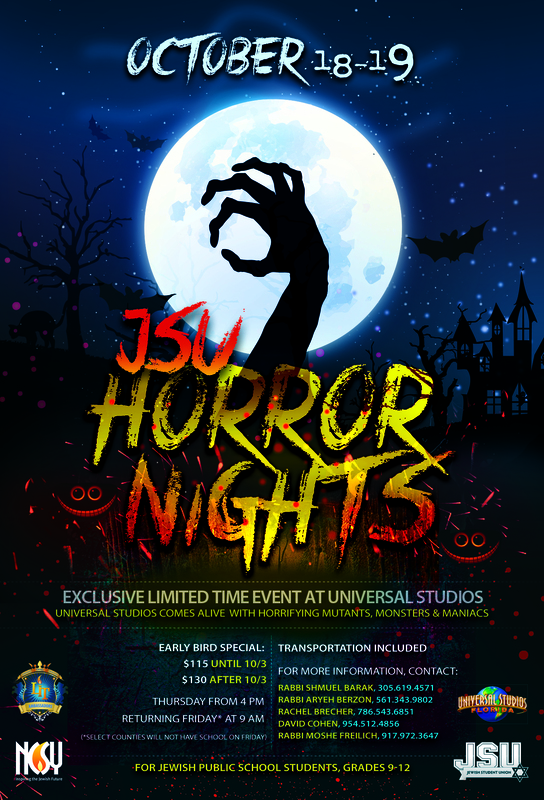 Please only register if you think you can handle the Horror Nights experience detailed below. There will not be alternative programming available. *Please do not register if you cannot handle the following: Intense audio, lightning, extreme low visibility, strobe lights, fog, damp or wet conditions, moving floors, special effects, sudden actions and overall physically demanding environment. You should not enter a hunted house if you suffer from asthma, heart conditions, prone to seizures, physical ailments, respiratory or any type of medical problem or suffer any form of mental disease including claustrophobia.